Posted August 20, 2015; Updated March 10, 2016; Disclaimer The information presented here is for informative and educational purposes only and is not intended as curative or prescriptive advice. The statements of this web-site have not been evaluated by the United States Food and Drug Administration (FDA). Nothing stated here should be considered as medical advice for dealing with a given problem, or to diagnose / treat / prevent / cure any disease. This is work in progress. When people are afraid of cancer, it is fear from dying that takes over. Fear of the unknown paralyzes one's thinking and disables the ability to make good life choices. It is not fear of dying from cancer, but instead, fear of not knowing about death itself that consumes the mind. Update Report March 10, 2016: This article may be helpful for approximate 58 million sun worshippers who inadvertently may have burned their skin under a hot blazing sun over many years. Over time, their skin was damaged by the sun’s ultraviolet [UV] rays probably causing scaly, crusty growths. This update summarizes the results of applying topical skin cream, Fluorouracil [ Efudex ], to various areas of my skin over a period of almost 10 continuous months. 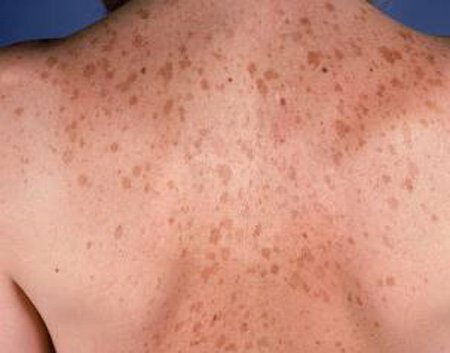 The skin was burned from over-exposure to the sun, causing scaly, crusty growths. These growths eventually become Actinic Keratosis [AK], a pre-cancerous skin condition or incubating cancer cells. [ Illustration on right ] AKs are rough, dry, tan- or pink-colored bumps, spots or blemishes that often appear on the skin near the eyes, on the nose, ears, lips, chest, back, and legs. 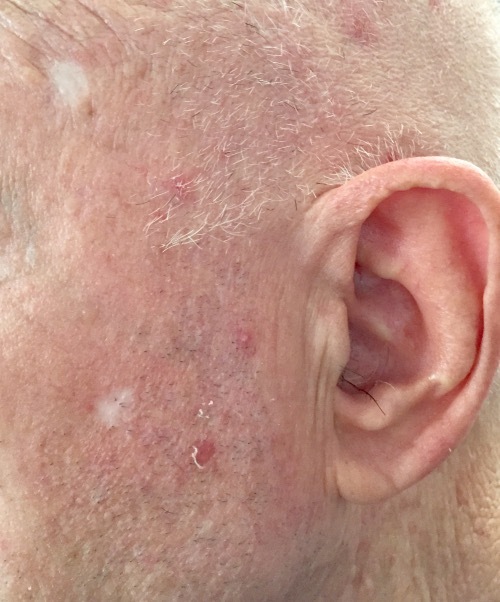 AKs are most common in fair-skinned, middle-aged or elderly individuals, who may have a single or many lesions [ as illustrated in the photo on the right ]. Applying Efudex to each each skin area takes about 8 to 12 days or longer, then an additional 30 or more days for each area to heal. The Skin Cancer Foundation estimates that "Though only about 10 percent of AKs turn into cancers, there is no way to know ahead of time which ones are precursors of squamous cell carcinoma." Those with sun burned skin may not be aware that they are a high risk to developing skin cancer. Just because you find an odd lump or bump on or under your skin does not mean you have discovered cancer . But there is something you can do to get rid of those red or brown bumps. Efudex has also been used to treat other skin problems. In the use of Efudex in this case, it appeared to also minimize the intense skin itchiness. The skin become clearer and smoother as well. But since nano-silver gel, ingested organic sulfur and ingested liposomal encapsulated vitamin C for a month were also applied, it cannot be concluded that Efudex was solely responsible for also clearing up the skin. Well, the good news is that you can get rid of incubating skin cancer cells with a special skin cream, Efudex [ fluorouracil ], that your dermatologist can prescribe and heal your self at home! Apply it for one to two months to get rid of potential incubating skin cancer. You do it yourself! Fluorouracil is FDA-approved for superficial Basal Cell Carcinoma [BCCs] or Actinic Keratosis, with 80% to 90% cure rates. Alert: But.... you should do so under the care of an informed dermatologist. Before using any skin medication, have a dermatologist confirm that the skin bumps are kerotoids and that they may harbor incubating cancer cells. You also need to be checked regularly while you are using fluorouracil skin cream, to monitor side effects and check your response to therapy. Assuming that you are able to get the prescription skin cream and that you have read the instructions, the actual application over a month or two is much more complicated than the information provided by your doctor. That is why my testimonial that follows may alert you to useful information and help you with your application of Fluorouracil. Here are my experiences in using Fluorouracil or Efudex. Minor application mistakes were made and adjustments were made as well. No sugar coating of information. 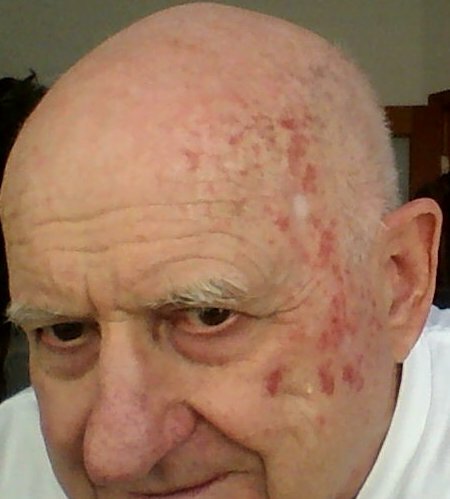 For many years, an 87 year old, had itchy, dry skin and skin bumps that doctors had no solution for except to recommend to keep the skin moist with skin creams that did not work. Apparently, this person over-exposed his skin to the sun for over 50 years while playing on the sunny beaches in San Diego. Beside dry and itchy skin, the ‘over-exposed to the sun’ skin formed little rough bumps called kerotoids. 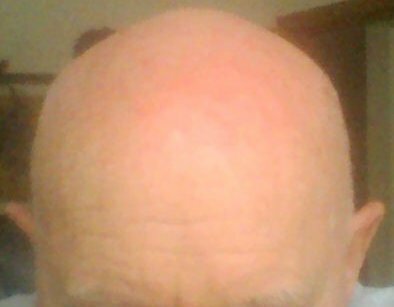 About a year ago this person had some rough sore spots on his left temple [face] that did not heal over time. 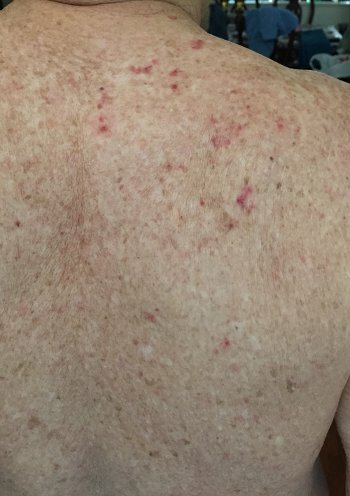 He went to a Kaiser dermatologist who did a biopsy and then zapped it with a single course of liquid nitrogen process referred to as cryotherapy. The sore was a pre-cancerous skin lesion [ actinic keratosis & superficial basal skin cancer ] that may have had incubating cancer cells. It was benign. Several months later he went back with another keratoid bump near the previous one on his left temple. His dermatologist, Dr. Bonilla, suspected it also was a similar lurking cancer cell and zapped it. Then she said that there was now a skin cream, Efudex, that could get rid of these hibernating skin cancer cells. Would he like to try it? Well, he jumped at this opportunity as he had nothing to loose. So she prescribed it and he began my long fight against skin cancer. The dermatologist cautioned him that there would be some discomfort and skin itchy-pain and that this skin cream was to be carefully used only as a topical skin application. It was important, after application of the skin cream, to wash the hands really well immediately after applying the skin cream so none of the cream is on the hands; thus keeping the skin cream from the eyes, nose and mouth. Early inflammatory phase: During the first week of application, mild inflammation & itchiness occurs. Inflammatory phase: During the following weeks, redness and swelling occur with crusting and itch burning. Tumor disintegration phase: Lesions resolve [ crust falls off ] as the skin exfoliates. Healing phase: Over 1 to 2 weeks or longer, new skin grows into the treatment area. Total healing time is about one month! Too much too Quick: Needless to say, the first application tothe temples was an experiment as the instructions for this skin cream were not the best. 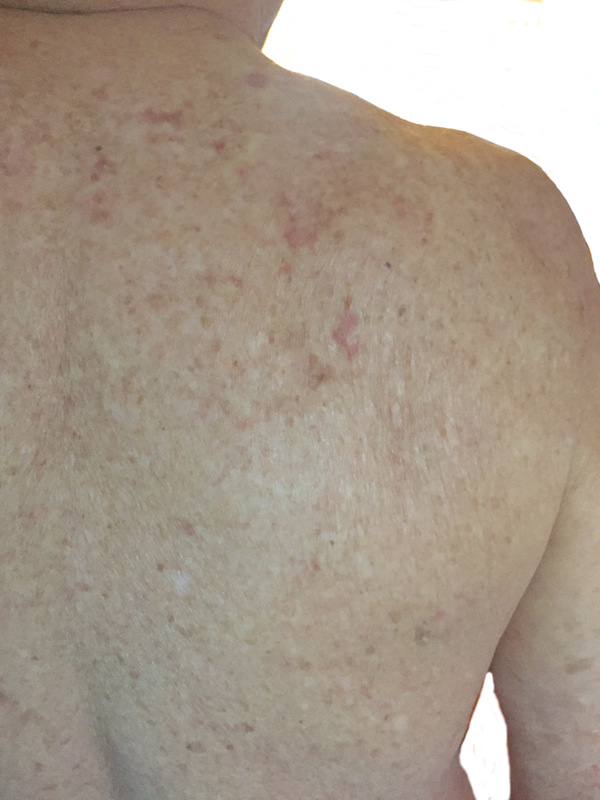 By trial and error, this person found how to apply it for one month to one area of the skin at a time; in order to avoid the Herxing effect or feeling sick that he experienced for several hours on two occasions. He did not realize that this feeling sick may occur long after he applied the skin cream to several areas at the same time. What happened was that the immune system killed too many cancer cells all at once, then released too many of the dead cancer cells and probably other body toxins all at the same time and flooded the blood stream. The kidneys could not excrete these wastes fast enough and hence the toxic wastes piled up in the blood stream, causing an uncomfortable and somewhat sick feeling; a very normal body reaction. Treatment: Recommendation is to apply the Efudex skin cream to the entire area instead of a few spots. By treating the entire area, a more uniform outcome should usually occur. After about three to five days, the treated the skin area became pink, then gradually a bright red color as the itchy pain intensified. The change in color progresses to a dark reddish color and about the 8th day a scab appears on the spots. About the 10th to 12th day a crust begins to develop that falls off. During the entire 12 or more days of skin cream application, the skin will be very itchy. 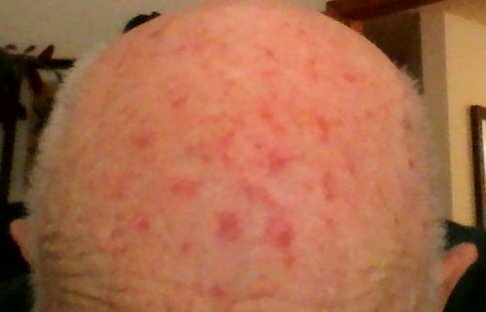 The itchiness and irritation is a sign that the the skin cream is working and the hiding cancer cells are getting destroyed. Relieving this itchiness is discussed later on. The application instructions that come with the prescription or from you doctor are usually to stop applying this skin cream when the crust forms into a scab that falls off about the 8th to 12th day. But following this advice depends on how burned your skin is and how strong your immunity is. The more severely burned the skin [ lots of red scabs ], the longer you may need to apply the skin cream beyond the 12th day. Just how much longer is probably going to be trial and error on your part. You do not really know whether you destroyed all the hibernating cancer cells on this first application. So after 15 days or longer, you let the reddish skin area heal for at least two to four weeks, until the reddish color disappears and the skin color returns to your normal, clear skin color. Dealing with itchiness: As explained previously, the skin cream does not kill the cancer cells directly; instead, it stimulates the immune system to release immune cells that cause the lurking cancer cells to die. The first 10 days are a very itchy time and some of the dermatologists suggest applying vaseline over the area. Vaseline is messy and doesn’t speed up healing; instead it plugs up skin pores. Instead of vaseline, this person used a special ASAP nano-silver gel that he got from his friend. It is the same silver gel that is used to help burn victims and it speeded up the healing process by about a week and minimized the itching. He began using silver gel about two hours after Fluorouracil application, when the skin felt somewhat dry and when the skin started to itch. The pink-red color gradually fades away in 3 to 6 weeks time after you stop using the skin cream application. It is during this after time that the lurking cancer cells disappear and the affected skin area re-grows and returns to normal skin color. During this regeneration time, the affected skin area may be itchy. 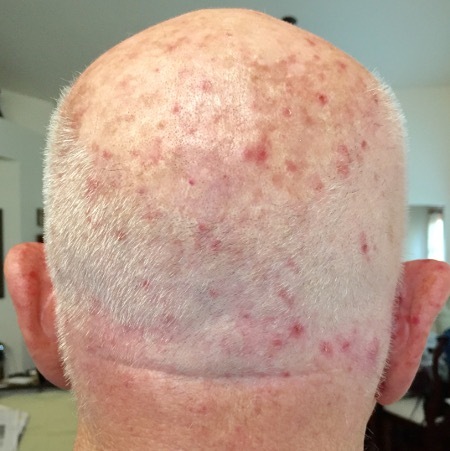 Previous to using Efudex, arms, scalp and all of his body were very itchy! But after treating the body with this skin cream, [Efudex], the itchiness has greatly subsided. The skin areas have cleared up considerably and the itchiness has subsided. Results of Efudex was confounded by adding numerous supplements to the healing process; notably organic sulfur [MSM] bulk flake crystal supplement & liposomal encapsulated vitamin C and nano-silver gel. Progress made: Applying this skin cream has been work in progress: treating all of the body areas. 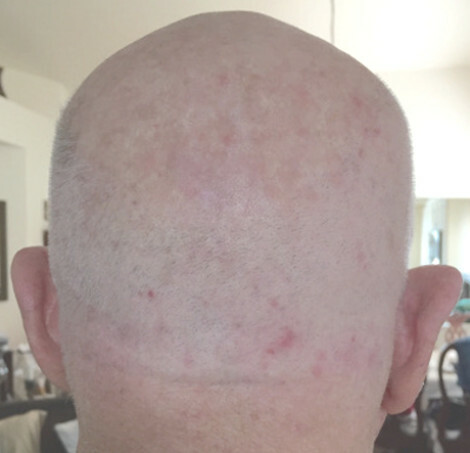 Since the first applications on arms and scalp were an experimental learning process, Efudex was re-applied for the second time to most of the body areas. 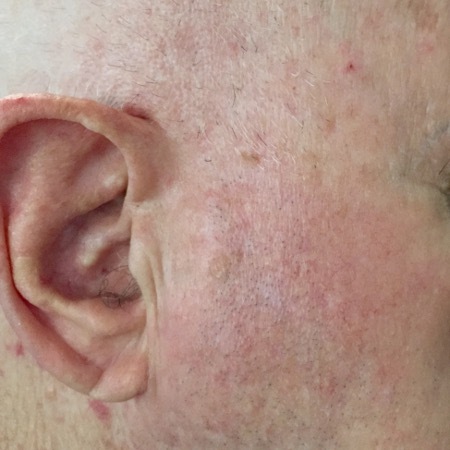 The result was that these pre-cancerous skin areas [ Actinic Keratosis [AK] disappeared and the skin became less itchy upon healing although the skin areas are sensitive. The skin is now smoother, has fewer kerotoids and a feeling of almost no itchiness. My main focus was to get rid of the cancer cells, heal as quickly as possible and minimize the inflammation and itchy pain. The now treated areas seldom itch. It is this person's belief, based on the improved skin texture [ fewer kerotoids, smother skin, and feeling less itchiness in the treated skin areas, that the entire treatment modality worked. 1. Length of treatment time with Efudex is unknown. Some cancerous kerotoids react within 10 days while other kerotoids take two weeks, a month or longer. Treating both aggressive and lazy kinds of skin cancer cells at the same time does not work very well. The first application of skin cream destroys the more aggressive actinic or cell skin cancers but may not awaken the lazy ones. This difference in length of time needed to awaken all lurking skin cancer cells may depend on the amount of skin damage done on different areas of the skin or/and also how good your immune system is. Since people are different, the length of application is an uncertain trial and error. 3. Efudex by itself may not heal the skin .... this treatment may need help from other substances and processes like the immune system, supplements like suflur and co-factor help from whole plant foods. 4. Need to have a passionate dermatologist monitoring and guiding the application of this skin cream every week for the first month in order to get "it right". 5. Hydrate often: drink water without chlorine in it; ample water each day to flush out the toxins out of your body. 6. Seeds such as almonds and apricot kernels, eaten in the proper dosage amounts, may prevent cancer; but applying this information to preventing skin cancer is unknown. 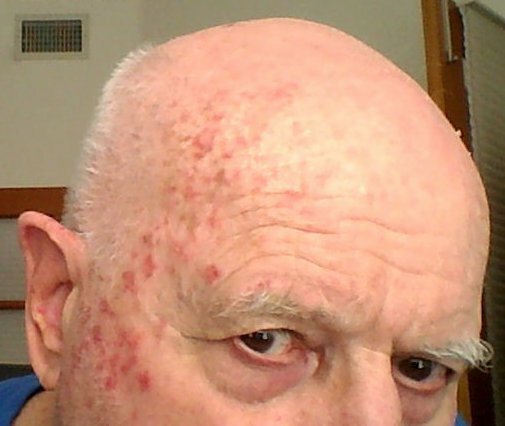 This person most grateful to dermatologist Dr. Bonilla, Kaiser Permanente, for prescribing the Fluorouacil Topical Cream USP, 5%. Efudex [Fluorouracil cream] should not be used by women who are pregnant, considering becoming pregnant, or nursing, since it can harm the fetus. It also should not be used if you have a dihydropyrimidine dehydrogenase (DPD) enzyme deficiency, since serious side effects may result. DPD is a hereditary condition that occurs in 3% to 5% of the population and requires a special genetic test to diagnose. In addition, tell your doctor if you: •	are undergoing radiation therapy; •	have previously had an unusual or allergic reaction to fluorouracil, other chemotherapy, other medicines, foods, dyes, or preservatives. Avoid sunlight as much as possible while using fluorouracil since it may increase your side effects. If exposed to sunlight, wear a hat and use sunscreen. As always, also avoid tanning booths, which have been clearly linked to squamous cell carcinoma and melanoma. Does Efudex [Fluorouracil] work? Yes it does destroy actinic keratoses. Using this skin cream may not be a recommended therapy to relieve skin itchiness, but it sure helped this person [ or did sulfur and encapsulated vitamin C make the difference? ]. But the results at this time are a mixed bag for this personal case due to confounding factors! There are many aspects in the Efudex [skin cream] application for which there are as yet no conclusive answers. The length of time needed to get rid of lurking skin cancer cells varies with the cumulative amount of sun exposure as well as the body site and normal skin color. Another variable is the technique of skin cream application, the amount used and when to stop applying the skin cream. Then there are the unknowns of diet and the state of the immune system which research studies have overlooked or simply ignored. The person using Efudex needs to have a dermatologist monitoring and guiding the application of this skin cream every week for the first month in order to get "it right", as well as requiring a little passionate amount of time by the dermatologist. Placebo effect: "The placebo effect is related to the perceptions and expectations of the patient; if the substance is viewed as helpful, it can heal, but, if it is viewed as harmful, it can cause negative effects, which is known as the nocebo effect. "